Created by: Robert Morales (writer), Kyle Baker (artist/inker), Axel Alonso (editor). Powers: Peak physical capability, Slowed aging, Skilled hand to hand combatant, Superhuman strength and healing factor. 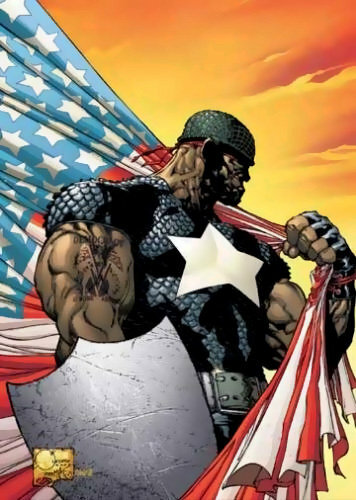 When captain America was presumed dead, and the super soldier formula along with him, the Americas tried to re-create said formula so they could have a super soldier again. To this end many African Americans were subjected to experimentation. Of those to survive was Isiah Bradley an outstanding black soldier and father of one. Isiah emerged the only viable and successful subject. He managed to stop the Natzi group who tried to create a German super soldier and was captured and tortured by them for months. When he was finally rescued by his American superiors he was court-martialed and jailed.While he was in jail his genetic son was born to a surrogate mother after 39 other attempts had failed. This son would grow up to become Josiah X. Years later he was pardoned by President Eisenhower and released. Over time the formula which gave Bradley his powers deteriorated his body and mind similar to Alzheimer’s. Around this time he met Steve Rogers the original captain America. His son Josiah X would also join a team known as the Crew with fellow Black Superheroes; War Machine and The White Tiger. His daughter would have a son who would lead the young avengers as Patriot. When his grandson was critically wounded a blood transfusion from him gave his Grandson all of his abilities. Bradley is an underground legend revered by many in the black superhero community, he was a special guest at the wedding of Storm and the Black Panther.